“saber spoke” wheels were available. 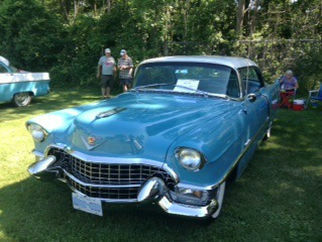 This immaculate Cadillac was discovered at a country car show in Ontario with its owners enjoying the beautiful warm day and talking to other car buffs about their treasures. This car was acquired (by it’s current owners) in 1979 in Calgary, Canada and driven on only sunny days for a year, then stored in British Columbia. These are the 5th owners of this car. Its first owners were in San Francisco California, then it was moved to Oregon then Calgary, then British Columbia, and since 2005 it resides in Ontario. This Cadillac has 81,000 miles on it. In 1991 a complete mechanical restoration plan began but that effort was slowed by having to locate the replacement of some stolen engine parts. Between 2006 and 2009 the restoration was finished. The paint and trim is accurate and the detail really becomes evident in the upholstery where the craftsmen at RM Restorations in Chatham, Ontario painstakingly measured each button and its placement so that all squares are exactly perfect. 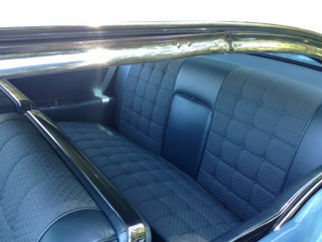 The new steering wheel cost $1800 alone and the colour of the leather hand grips dictated a repaint of the interior metal trim to match. 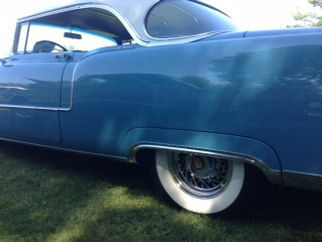 The wire wheels are real also and the huge trunk is totally reupholstered as if it just came from the Cadillac factory. 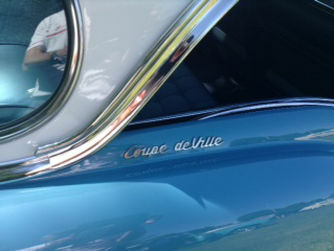 The whole car is restored to as close to original as possible. “The power”, say the owners, “is more than adequate”. 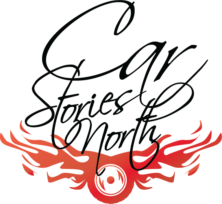 You find the nicest cars and the nicest people at some of these classic car gatherings!